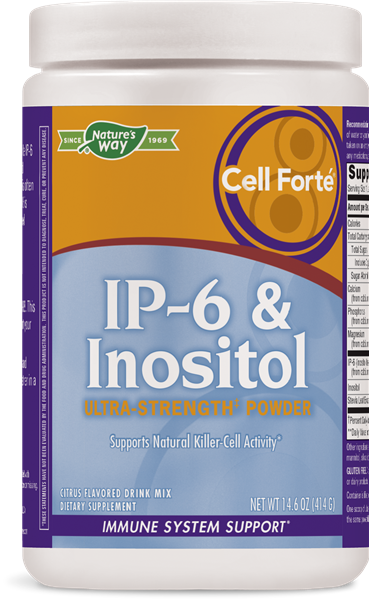 Cell Forté® w/IP-6 & Inositol (powder) / 14.6 oz - Nature's Way®. Why Supplement with Cell Forté® IP-6 & Inositol? While IP-6 is found in rice bran and other foods, there are good reasons to take an IP-6 & Inositol supplement. First, IP-6 is better absorbed in pure form without any competition from proteins and other nutrients. In addition, it is often lacking in foods that have been processed since IP-6 is usually found in the bran or hull, which is often milled away. Why Supplement with Enzymatic Therapy® Cell Forté® IP-6 & Inositol? IP-6 (found in the bran of brown rice and other foods) and inositol (part of the vitamin B family) are featured together in a unique, powerful ratio found only in Cell Forté IP-6 & Inositol. Take 1 level scoop once daily, mixed in 6-8 fl oz of water or your favorite beverage. Mix well before drinking. Best taken on an empty stomach. If pregnant, nursing or taking any medications, consult a healthcare professional before use. ‡As compared to Cell Forté IP-6 & Inositol capsules. ‡‡SPINS IP-6 Ingredient Brands; 52 weeks ending 2-19-17; total U.S. X-WF. One scoop of ultra-strength Cell Forté® IP-6 & Inositol Powder deliver the same powerful benefits as 8 vegetable capsules. Why do the directions on the Cell Forté® IP-6 & Inositol label state to take it between meals? Because the proteins in food can slow the absorption and bioavailability of Cell Forté® IP-6 & Inositol, it is best taken (as stated on the label) on an empty stomach. However, if taking Cell Forté® IP-6 & Inositol with meals is the most convenient time, a low protein meal that’s high in fruits and vegetables will have less impact on absorption than high protein foods such as meat or fish.